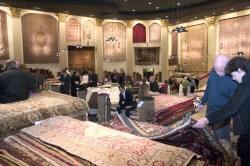 The former Villa Theatre building has been renovated and reopened as the new location of Adib's Rug Gallery. The Villa Theatre opened on 23 December 1949, showing Prince of Foxes on a screen 26 feet wide by 20 feet high, "one of the largest in the West. "1 Evening ticket prices were 75 cents for adults and 20 cents for children, and key advertising features were air conditioning and free parking for 500 cars. The stage was covered with a beautiful waterfall curtain with 3000 square yards of velvet drapes in pastel shades. Vast murals, in light pale colors against a dark red background, brightened the walls of the auditorium with scenes of women at work in agricultural pursuits and men fishing. In the 1950s and 1960s, the Villa was the first and sometimes the only Salt Lake theater to show new widescreen formats such as CinemaScope, TODD-AO, Technirama-70, Cinemiracle, and Cinerama. In 1958, the Villa drew nationwide attention for its 10-month and 4-day run of South Pacific. Moviegoers came to the theater from all parts of Utah, as well as southern Idaho and eastern Nevada. There were 280,000 paid admissions for the 435 performances, about 50,000 more than the estimated population of Salt Lake City at the time. The biggest alteration to the Villa came when Cinemiracle was installed in August 1960. A large "100-foot curved screen"4 was built at the front of the auditorium, reducing seating capacity by about 300 seats and hiding the stage and its beautiful draperies. Probably at the same time the white ceiling of the auditorium was painted blue and the original red background of the murals was painted over with a more neutral color. In July 1961, Cinerama came to the Villa Theatre, starting with a benefit premiere of This Is Cinerama complete with a red carpet and a live performance by the Mormon Tabernacle Choir. The Villa showed three-projector Cinerama until February 1964, when it was converted to the new Cinerama process which used a 70mm print on a single projector. The theater continued to show Cinerama through 1969. A newspaper article on the splitting and expansion of the Cottonwood Mall theater said that Mann Theatres expected to "add one or two theaters to the Villa Theatre . . . in the spring of 1977. "5 The article gave no details on whether the Villa's auditorium would be split or if additional auditoriums would be built onto the side of the exisiting building. The planned expansion, however, never took place and the Villa remained a single-screen theater. Carmike Cinemas, which acquired the Villa Theatre in 1993, began making repairs to the theater in 1995 when they restored the neon on the theater's sign. In 1996, Carmike closed the Villa for several days for a major renovation which included installing new carpet, seats, screen, JBL speakers, a Dolby Digital sound system, and handicapped seating areas in the auditorium. The lobby was remodeled with a new concession stand, drinking fountain, and a handicapped restroom. The original box office window was removed and replaced with a large box office that extended under the entrance canopy. New neon poster cases were installed at the front entrance and the parking lot was repaved and new lighting installed. After February 1997, french doors were added to separate the lobby from the auditorium. In 1998 Century Theaters demolished its aging domed theaters west of the Villa Theatre and replaced them with a new multiplex with stadium seating, digital sound, and THX certification in all 16 theaters. This was the start of building trend that resulted in an almost complete changeover of first-run theaters in the Salt Lake Valley. The Century 16 was followed by the Megaplex 17 at Jordan Commoms, Cinemark 24 at Jordan Landing, Carmike Ritz 15, and the Megaplex 12 at the Gateway. All first-run theaters built before 1998, except the Carmike 12, Holladay Centre 6, and 5 Star Cinemas, were eventually forced to close permanently or change venues. Along with many other theater chains across the country, Carmike Cinemas suffered financially from building too many new multiplexes. After Carmike entered bankruptcy in the fall of 2000, the Villa Theatre was put up for sale with an asking price of $2.4 million. A sale of the Villa to the owners of the Simantov Oriental Rug Gallery fell through in 2001. After USA Today included the Villa Theatre in a list of ten great classic theaters in the United States6, former Deseret News movie critic Chris Hicks criticized the Villa as being run-down and undeserving of acclaim.7 Carmike responded by cleaning the theater, making repairs, and running a special ad for the Villa for the big hit of the 2002 summer movie season: "Star Wars: Episode II: Attack of the Clones." Despite increased ticket sales at the Villa during 2002, the financial improvement was not enough to justify taking the former Cinerama theater off the market. In November 2002 Carmike even looked at simplifying or replacing the theater's neon sign, which was expensive to maintain and a barrier to the theater's profitability. As early as July 2002, Wal-Mart was looking at the Villa site as a possible location for one of its Neighborhood Market stores. Harmons Grocery, which operates a grocery store near the Villa Theatre, countered by buying the Villa property themselves. Harmons offered to let Carmike Cinemas lease the theater, but Carmike declined. The last movie to show at the Villa Theatre was "Lord of the Rings: The Two Towers" on 18 February 2003. Despite being a Tuesday evening and a long movie, the two-month-old epic drew a large crowd for the Villa's last performance. Carmike Cinemas repaired the neon on the theater's sign and marquee during the Villa's last week of operation so that it would be in perfect condition for closing night. Not long after the Villa closed, Harmons started a sale of the theater to a buyer that wanted to turn it into "Club Villa," a night club with a high-tech dance floor. Harmons ignored a number of groups interested in using the Villa as a theater, including one theater chain that was frustrated that Harmons would not even return their phone calls. At one point the sale to the night club group appeared to be about to finalize, but then it fell through. In May 2004, Harmons Grocery sold the Villa Theatre to Dr. Hamid Adib, owner of Adib's Rug Gallery at 3142 South Highland Drive. Adib plans to create a museum-like atmosphere where people can come and enjoy the fine craftsmanship and elegant beauty of Persian and Oriental rugs and at the same time relive their past good memories of the Villa. Adib does not know how long the renovation will take, but he wants to take the time to do the job properly.